BEAT THIS SHORTS is a podcast version of the radio show focusing ON AIR interviews of featured guests on Magic 92.3 Cebu and on this episode, we talked with Cebu-based young rapper, XUEDE, last February 24, 2019, on his first time collaboration with Singaporean act, RICHARD JANSEN and how they made their latest single "Rest in da Bank". 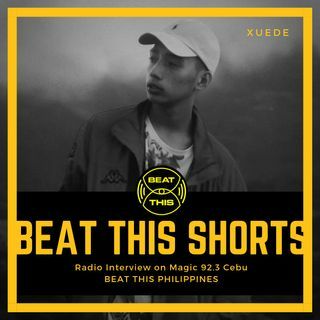 Take a listen and know more about XUEDE. BEAT THIS PHILIPPINES is a concept show that started around June 2017 in association with Local Vocal Radio ... Maggiori informazioni heard on terrestrial radio station, Magic 92.3 Cebu. The idea was to compile and feature music from the Philippines that are in the electronic beats and digital sound production category.